This article is about the tool. For professional artists who work with scissors and paper, see Papercutting. 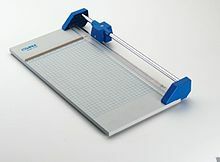 A paper cutter, also known as a paper trimmer, also sometimes described as a paper guillotine, is a tool often found in offices and classrooms, designed to cut a large set of paper sheets at once with a straight edge. Paper cutters, similar to those of today, were patented in 1844 and 1852 by Guillaume Massiquot. They have been around since the late 1830s, when, in 1837, Thirault built a model with a fixed blade to a flat surface. Since the middle of the 19th century, considerable improvements have been made by Fomm and Krause of Germany, Furnival in England, and Oswego and Seybold in the United States. Paper cutters vary in size, usually from about 30 centimetres (1 ft) in length on each side for office work to 841 millimetres (33.1 in) (an edge of A1 paper) in design workshops. The surface will usually have a grid either painted or inscribed on it, often in half-inch increments, and may have a ruler across the top. At the very least, it must have a flat edge against which the user may line up the paper at right-angles before passing it under the blade. It is usually relatively heavy, so that it will remain steady while in use. On the right-hand edge is a long, curved steel blade, often referred to as a knife, attached to the base at one corner. Larger versions have a strong compression coil spring as part of the attachment mechanism that pulls the knife against the stationary edge as the knife is drawn down to cut the paper. The other end of the knife unit is a handle. The stationary right edge of the base is also steel, with an exposed, finely-ground edge. When the knife is pulled down to cut paper, the action resembles that of a pair of scissors, only instead of two knives moving against each other, one is stationary. The combination of a blade mounted to a steady base produces clean and straight cuts, the likes of which would have otherwise required a ruler and razor blade to achieve on a single page. Paper cutters are also used for cutting thin sheet metal, cardboard, and plastic. The blade on a paper cutter is made of steel, which provides long-term durability. The steel blade can be resharpened as needed. A variant design uses a wheel-shaped blade mounted on a sliding shuttle attached to a rail. This type of paper cutter is known as a rotary paper cutter. Advantages of this design include being able to make wavy cuts, perforations or to simply to score the paper without cutting, merely by substituting various types of circular blades. With a rotary cutter, it is also almost impossible for the user to cut him/herself, except while changing the blade. This makes it safer for home use. Higher-end versions of rotary paper cutters are used for precision paper cutting and are popular for trimming photographs. An even simpler design uses double-edged blades which do not rotate, but cut like a penknife. [clarification needed] While cheaper, this design is not preferable for serious work due to its tendency to tear paper, and poor performance with thick media. Most paper cutters come equipped with a finger guard to prevent users from accidentally cutting themselves or severing a digit while using the apparatus. However, injuries are still possible if the device is not used with proper care or attention. In the modern paper industry, larger machines are used to cut large stacks of paper, cardboard, or similar material. Such machines operate in a manner similar to a guillotine. Commercial versions are motorized and automated, and include clamping mechanisms to prevent shifting of the material during the cutting process. 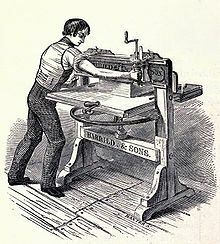 Wikimedia Commons has media related to Paper cutters. ^ "Etherington & Roberts. Dictionary--guillotine". This page was last edited on 3 February 2019, at 12:48 (UTC).